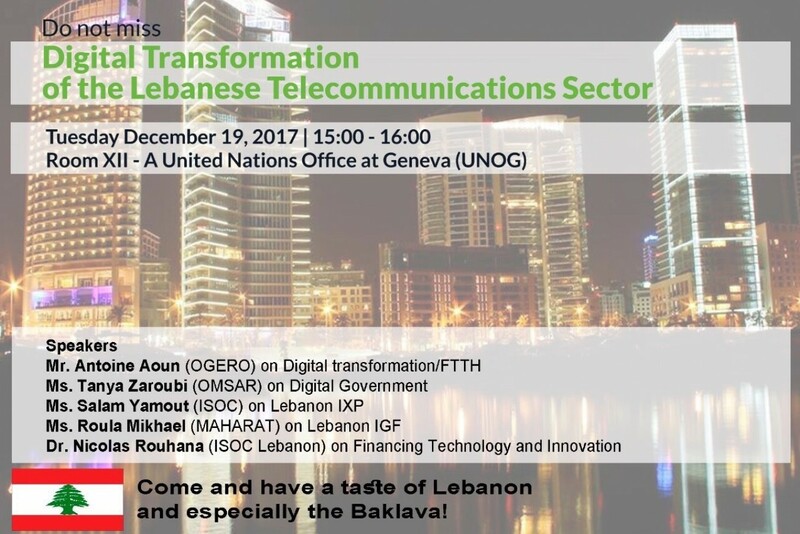 The International Cooperation office at OGERO organized on December 19,2017 an Open Forum at the United Nations offices, during the IGF 2017 in Genava to present The Digital Transformation of the Lebanese Telecoms Sector. Mr. Antoine Aoun, Technical Director Assistant- OGERO: presented the national plan for the development of the telecommunication sector in Lebanon at various levels, starting with the infrastructure, to develop the international communication lines and to benefit from its capacity more broadly, in parallel with the modernization of international portals, to extend networks for delivery to new subscribers. The project of building an integrated fiber optic network provides connecting capacities enabling the subscriber to benefit from higher speed and better services. In addition, the WLL network has been replaced with an advanced LTE network, a Data Center for Lebanon is being established to host data locally, and the provision of cloud services is planned to all interested entities. Ms. Tania Zarubi - Office of the Minister of State for Administrative Reform: addressed the challenges of adapting the digital services of public institutions to the expectations and needs of users, which requires more work to share data and synergy. She also stressed the need to work to implement the recommendations that emerged from the May 2015 Digital Government Conference, notably the establishment of a portal for government institutions, the promotion of open source technologies, the provision of electronic services and e-payment, and the adoption of legal frameworks that encourage innovation. Ms. Salam Yamout - ISOC Middle East Regional Director: introduced the Lebanon IXP initiative, which will work with the Ministry of Telecommunications and Ogero to secure a local point of access to the Internet, reducing the cost of communication and encouraging the creation of local data centers. Content providers, universities, media organizations and large companies will be encouraged to use this exchange point because of its impact on securing services at lower cost and greater speed. Ms Roula Mikhael - Maharat's Executive Director: spoke about the initiative of the Lebanese Internet Governance Forum launched by the Ministry of Communications and attracted 25 members to form the multi-stakeholder advisory body, whose first general secretariat is managed by Ogero. She confirmed that the Lebanese Civil society has seen this initiative positively, especially as it seeks to secure a transparent and open dialogue on Internet Governance, This initiative has always been waited for, It is time for all stakeholders from public, private, civil society, academia and academia to share experiences in this field. She also mentioned the activities that the Advisory Group (LMAG) began to organize to raise awareness of the work of the Forum that will held its first meeting in 2018, its objectives and the expansion of participation. Mr Nicolas Rouhana - ISOC Lebanon Vice President and the GM of IM Capital: presented the opportunities available today in Lebanon in the field of Entrepreneurship and Innovation, especially with the presence of promotional circulars by the Banque du Liban. These circulars have led banks to increase their investments in startups and have given examples of existing support funds today, including those specifically designed to support women. Special thanks to the event's Organizer Zeina Bou Harb (Ogero Telecom), Moderator Antoine Aoun (Ogero Telecom), and the Rapporteurs Layal Bahnam (Maharat) and Zeina Bou Harb (Ogero Telecom).